These last two weeks have been quite busy as I’ve been building and transforming some furniture for an apartment I have to decorate. I spent most of the time at home which means I had time to cook and try new recipes I had on my to-do list for a while. I will be sharing them soon, they are not only healthy but delicious too. Do you remember my churros? It is possible to eat healthy and enjoy the food too! Today I bring you some delightful desserts, four healthy recipes to complement any meal. Remember you can replace sugar for any other sweetener such a stevia, agave syrup, coconut sugar, xilitol or any other you normally use. Few things are more satisfying than finishing off a meal with a tasty dessert. From decadent cheesecake to cookies to refreshing frozen treats, there are hundreds of recipes to choose from. However, if you are watching your weight or want to reduce your sugar intake, finding dessert recipes that fit your nutritional needs can be a challenge. If you want to indulge without derailing your diet or eating a lot of sugar, here my four healthy dessert recipes that might help you maintain a balance between the two. This recipe is low in sugar and can be added to plain yogurt or served over soy milk ice cream. It is also simple to make and requires less than twenty minutes to prepare. For this recipe, you will need two cups of blueberries, three tablespoons of water, ¼ cup of sugar, (or sugar substitute if you wish,) and two teaspoons of lemon juice. 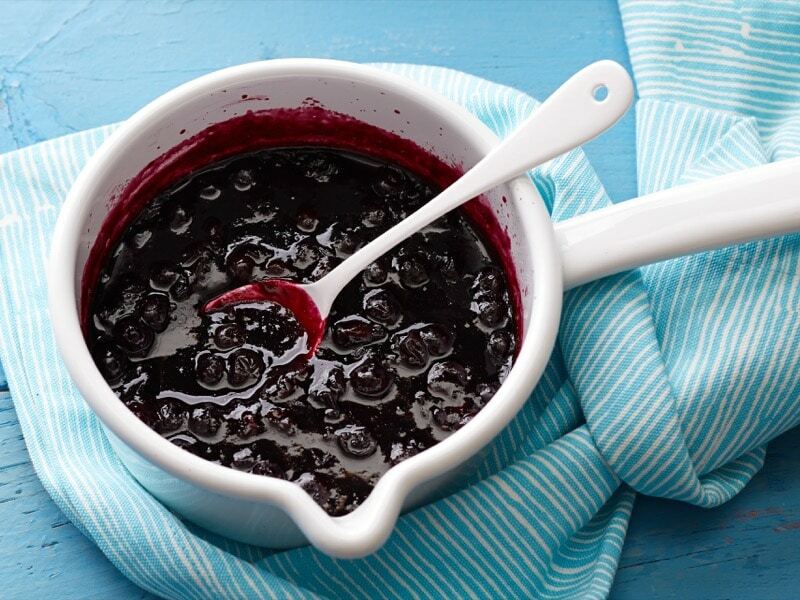 To begin, divide the blueberries into one cup apiece and then combine one cup with the lemon juice, sugar, and water. Simmer this mixture in a medium saucepan for about ten minutes until well blended and then add the other cup of blueberries. Cook all the ingredients together and stir them frequently. Compote is best served warm over a variety of frozen treats. 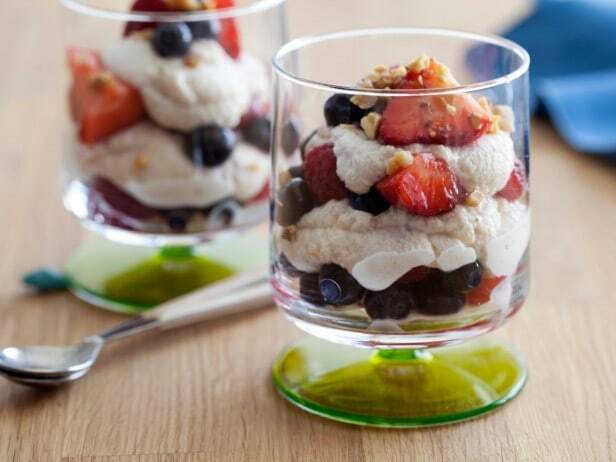 Heart-healthy walnuts and a blast of berries packed with vitamins and antioxidants are the stars of this delicious dessert, which only has 10 grams of fat and 13 grams of energy-building protein. For this recipe, you will need one cup of blueberries, one cup of raspberries, one cup of halved strawberries, two tablespoons of maple syrup, ¼ cup of confectioner’s sugar, one teaspoon of grated orange zest, ½ teaspoon of ground cinnamon, fifteen ounces of part skim ricotta cheese, and four teaspoons of chopped walnuts. To begin, combine all the berries in a bowl with the maple syrup and set them aside for five minutes. Meanwhile, combine all the other ingredients and blend them using the pulse setting on your blender. Blend it until it has a smooth consistency and then layer both mixtures into four parfait glasses until you reach the top, ending with the berry mixture, and then top it all off with the chopped walnuts. This treat can be substituted for an ice cream sundae, as it has a satisfying texture and just the right amount of sweetness. Few desserts are as satisfying as cookies, and these cookies are made with Hampton Creek Just Cookie Dough, which contains no preservatives and is egg and dairy-free. This makes them a good fit if you are trying to cut dyes or artificial ingredients from your diet. For this recipe, you will need one jar of peanut butter Just Cookie Dough, one cup of chocolate chips, two teaspoons of coconut oil, and ½ cup of roasted salted peanuts. Begin by lining a cookie sheet with parchment paper. Then roll heaping teaspoons of the cookie dough in your hands to make spheres. Cover them with plastic wrap and chill in the fridge for thirty minutes. Then, once they are nearly done chilling, melt the coconut oil and chocolate together in a small saucepan as you chop the peanuts. When the chocolate is melted, pour it into a bowl and use a fork to dip the chilled cookie balls into it. Once they are all dipped, sprinkle them with the chopped peanuts and return them to the fridge for another thirty minutes. Delicious! Are you looking for a healthy dessert alternative to ice cream? If so, this recipe might fit the bill and it only takes a few minutes to prepare. 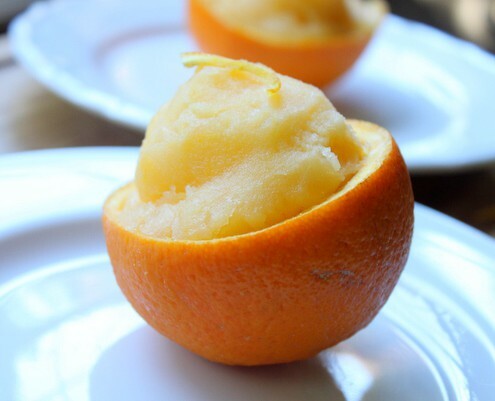 All you need to make this tasty sorbet is one pound of your favorite fruit, ½ cup of plain yogurt or silken tofu, and ¼ cup of sugar or a bit less if you are using a sugar substitute, such as Stevia. Start off by combining all the ingredients in your blender, then add a few tablespoons of water until the mixture is completely smooth. Add water as needed until you reach the right consistency, and then either serve it right away or allow it to freeze for later. This is a sweet treat that contains only 130 calories per serving. Whether you are watching your weight or trying to cut back on sugar, these dessert recipes are big on flavor but low in sugar and fat, so enjoy them on your own or with the family as part of a balanced diet. Are you mouth watering right now? I hope so! As you can see all of them are easy to make and your family will be more than happy having them after a meal. Do you have a favorite dessert? I would love to hear about your favorite one, and if you try any of this would love to know if you liked it too. Disclosure: This is a sponsored post but all opinions are my own. You can read my full Disclosure. This entry was posted in Health and tagged Dessert, Health. Pili, these healthy desserts look amazing!! 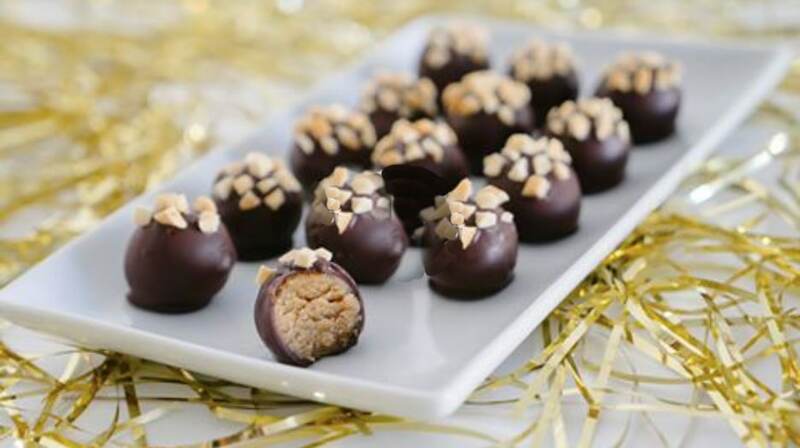 Those peanut butter chocolate truffles definitely have my mouth watering, peanut butter and chocolate is the best combination! Thanks for sharing these healthy desserts! !